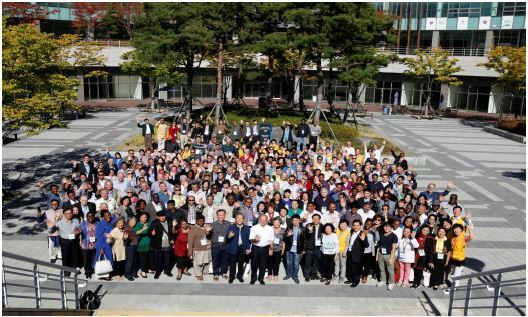 Transform World 2020 held its 2015 Summit, from October 12-16, at the Songdo Global University Campus in South Korea’s Incheon Metropolitan City and brought together 229 servant catalysts and facilitators on God’s mission of transformation from 52 countries. The theme for the Summit this year was the Ideological challenge and the transforming power of Christ’s love. We were reminded from the beginning of our time together that, until transformation happens in our own heart, there will not be transformation in our land. Daniel Kim, executive chair of the TW 2020 Steering Committee, opened our sessions by presenting a picture of transformation offered by Jesus in the Parable of the Mustard Seed relating to the Kingdom of God in which yeast moves throughout the flour and becomes bread for all too eat. Like the mustard seed, we are weak, poor and small so let us be humble. Our inner transformation must come first. Our real challenge is to abide in Christ. Worship and prayer must be at the center of all we do. We were encouraged by Djohan Handojo, chairman of Transform World Connections in the final remarks of the Summit that we need to be watchmen in our cities with emphasis on praise and worship and prayer referencing and personalizing Habakkuk 2:2 “I will stand at my watch… I will look to see what he will say to me…” for there is the promise “For the revelation awaits an appointed time; it speaks of the end and will not prove false. Though it linger, wait for it; it will certainly come and will not delay.” Indeed, revelation had come throughout the Summit as participants shared their Kingdom advance stories, imagining what expected outcomes fulfillment by 2020 could take place based on these Kingdom advances. We were listening carefully for stories that related to our theme resulting from the unprecedented migration from Syria and surroundings. In that regard, Jamal H. from Jordan noted: “This is the time to demonstrate the power of Christ’s love.” As migrants came through Jordan they saw love in action and responded as they witnessed and experienced the transforming power of Christ’s love. And so it was. One of the persecuted cultural Christians from Iraq said to him: “The Jesus that I have never known is now in my heart.” We received a report from our brothers and sisters in Christ from the Middle East about how the number of believers in Jesus from the majority community have not only doubled in Jordan but in all of the region. One pastor from Jordan reported a fivefold growth in his congregation in the past two years. VH, constrained by the love of Christ, has been used by the Lord of People to proclaim Him as Lord and personally witnessed around fifty thousand people come to Christ in a North African country according to a reliable source telling the story at the Summit. We recognized this Summit as a call for Agape Kingdom Advance by servant catalyst facilitators of the Transform World Movement as we face the ideological and other great challenges of our time. More than one half of the participants completed an appreciative inquiry before the Summit in which they wrote their story the relating to the challenge, sphere and region of their choice. The second speaker in our opening session, Kim Bum Il, Canaan Farmer School, underscored the same concern for following Christ’s example of love in action in mission that resulted in the transformation of South Korea in dramatic contrast to North Korea.1 When you compare the difference between the development of North and South Korea it comes down to one word: love. There is widespread agreement that the engine for the rapid development of South Korea emerged out of the new village movement, launched out of the Canaan Farmer School, rooted in the “love” seed. The higher part of the property is where his father Kim Yonggi would seek God in prayer in the early hours of the morning and again later in the day to teach the love of God. The central area where the training takes place is to teach the love of neighbors. The lower part is where the fields are cultivated to teach the love of soil. To live the Christian life means to follow the life of Jesus Christ. “His life was characterized by work, service and sacrifice so should we.” The teaching and practice at the Canaan Farmers School from the beginning until today was expressed by three words: work, service and sacrifice based on this one word, love. Sacrifice was based on the love of God, service on the love of the neighbor and work, on the love of the soil. The underlying theme in the teaching of more than 750,000 people from Korea and many parts of the world that has resulted in the transformation of South Korea and beyond was the love of God. Kim Bum Il’s testimony underscored the title for this summit is “The Ideological Challenge and the Transforming Power of Christ’s love. We were reminded in the final presentation of the first evening, that, as God’s change agents in Transform World 2020 we were called to root our mission in agape love just as God rooted His mission to the world in agape love, as supremely expressed in Christ’s self-sacrificing love. It was noted that this was, in fact, the way the Executive Board members, Chairpersons of Boards and Commissions and those at higher leadership positions of one of the largest denominations in Ethiopia, the Ethiopian Evangelical Church Mekane Yesus with some seven million members responded when they received the report of the beheadings of Ethiopian Christians in Libya on April 19 while they were gathered in session. They issued a directive “to the dear people of Ethiopia” appealing to the original purpose of human creation and harmony by striving together for mutual benefits and contributing to betterment of others and then they quote one verse only. ‘Love your neighbor as yourself…” (Mark 13:31) as the commandment of the Lord to do whatever is good for a neighbor that one does for his own. We were blessed to have eleven servant leaders, including Gen Yer’s from Ethiopia at the 2015 Summit who are hosting the TW 2020 Global Leadership Summit 2017 in Addis Ababa, Ethiopia, October 16-20. We were moved by the report on the Back to Jerusalem Movement by representatives of the twelve delegates at the Summit who had come from China. Just ten days earlier, we were at the launch of China Mission 2030 with almost one thousand pastors and leaders from who had developed a specific plan to send out 20,000 Chinese missionaries by 2030. We were amazed to hear from Pastor Gao that one of the two strategies they shared with us in relation to their Back to Jerusalem movement is friendship with Ishmael, son of Abraham. As I sat in on the break out session of the Poverty Challenge among the eighty delegates, facilitated by Hal Jones, I heard the Kingdom advance report of Hana Amalia Vandayani who is seen deepening understanding and strengthening relations with others of a different ideology, along with Iman Santoso, with the microphone, at the Transform World SE Asia Poverty & Ideology ‘Walk & Talk’ Conference, held 14- 17 September 2015 with the theme “Building Bridges, Transforming Lives” in Indonesia, facilitated with the engagement of Juliette Arulrajah, SE Asia facilitator for TW 2020. Hana embodies the Transforming Power of Christ’s love in Indonesia through her engagement with the poor, marginalized and homeless for the last 20 years by building bridges of love with them that they feel so comfortable to call her ‘ Mama’. She has started medical clinics, pre-schools, livelihood projects, advocates for birth certificates and IDs for them as well as holds mass weddings bridging many aspects of several of the spheres and challenges of TW 2020 through various measures. As we concluded the Summit we dedicated our full time coordinator for Transform World 2020, John Hur, with thanksgiving for his readiness to serve us all. 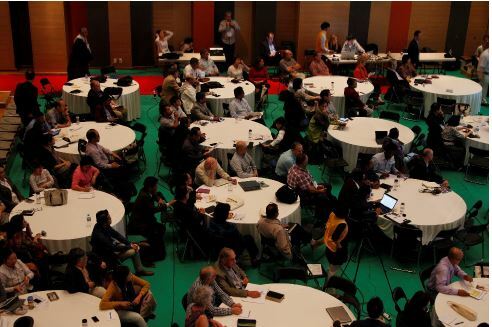 We look forward to coming together for the Transform World 2020 Global Leadership Summit in 2016 in New Delhi from October 21-24, hosted by Richard Howell and providing support for the International Youth Festival 2016, which is designed to challenge, train and prepare 30,000 youth and 5,000 pioneering church planting Pastors from all over India and seven neighboring Countries from 26th to 30 October catalyzed by Vijah Mohod who serves as TW 2020 South Asia Gen Y facilitator. Our theme for TW 2020 2016 Summit will be Christ’s Missional Challenge: the Great Commission. Conclusion: As God’s beloved community from different generations, we are committed to respond to the challenges we face in all spheres of cultural influence in our regions and through the Transforming Power of Christ’s love. Our prayer for each of us in God’s beloved community in the Transform World 2020 Movement is “… being rooted and established in love, may have power, together with all the Lord’s people, to grasp how wide and long and high and deep is the love of Christ, and to know this love that surpasses knowledge–that you may be filled to the measure of all the fullness of God” (Ephesians 3:17-19).